where $\alpha,\beta,\gamma$ are the angles which line $P_1P_2$ makes with the positive $x,y,z$ axes respectively and $d$ is given by the figure above. These are also valid if $l,m,n$ are replaced by $L,M,N$ respectively. where $a,b,c$ are the intercepts on the $x,y,z$ axes respectively. DISTANCE FROM POINT $(x_0,y_0,z_0)$ TO A PLANE $Ax+By+Cz+D=0$. where the sign is chosen so that the distance is nonnegative. where $p=$ perpendicular distance from $O$ to plane at $P$ and $\alpha, \beta, \gamma$ are angles between $OP$ and positive $x,y,z$ axes. where $(x, y, z)$ are old coordinates [i.e. coordinates relative to $xyz$ system],$(x', y', z')$ are new coordinates [relative to the $x'y'z'$ system] and $(x_0,y_0,z_0)$ are coordinates of the new origin $O'$ relative to the old $xyz$ coordinate system. where the origins of the $xyz$ and $x'y'z'$ systems are the same and $l_1,m_1,n_1; l_2,m_2,n_2; l_3,m_3,n_3$ are the direction cosines of the $x', y', z'$ axes relative to the $x, y, z$ axes respectively. where the $O'$ of $x'y'z'$ system has coordinates $(x_0,y_0,z_0)$ relative to the $xyz$ system and $l_1,m_1,n_1; l_2,m_2,n_2; l_3,m_3,n_3$ are the direction cosines of the $x' , y', z'$ axes relative to the $x, y, z$ axes respectively. 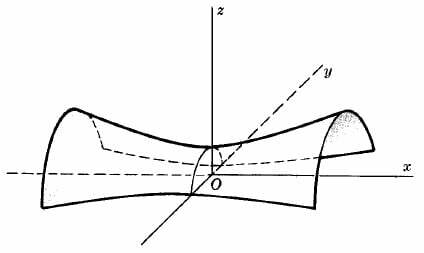 A point $P$ can be located by cylindrical coordinates $(r, \theta, z)$ as well as rectangular coordinates $(x, y, z)$. A point $P$ can be located by spherical coordinates $(r, \theta, \phi)$ as well as rectangular coordinates $(x, y, z)$. where the sphere has center $(x_0,y_0,z_0)$ and radius $R$. where the sphere has center $(r_0,\theta_0,z_0)$ in cylindrical coordinates and radius $R$. where the sphere has center $(r_0,\theta_0,\phi_0)$ in spherical coordinates and radius $R$. where $a, b$ are semi axes of elliptic cross section. If $b = a$ it becomes a circular cylinder of radius $a$. Note orientation of axes in the figure.